Scottsdale may look like a suburb of neighboring Phoenix, but its own origins in agriculture and as a haven for culturally enlightened visitors from the East and Midwest had nothing to do with the city that would eventually eclipse it in size. The retreat vibe is still intact in Scottsdale’s shop- and gallery-filled Old Town, replete with the occasional kitschy Western trappings. The rangy city, which runs 31 miles south to north, has filled up with golf and spa resorts that make it a popular snowbird destination. For visitors seeking what many of Scottsdale’s original residents came for — including communion with nature and stimulating culture — the destination, with a dip here and there into neighboring communities, has much to offer, including new design tours, foraged meals and art attractions, in addition to warming doses of Arizona sunlight. Edward Varney is the architect who designed the midcentury-modern Hotel Valley Ho in 1956, which then attracted celebrities — among them Natalie Wood and Robert Wagner — seeking to slip the limelight of Hollywood. Today, the hotel concierge and architectural guide Ace Bailey keeps their spirits alive in 90-minute Magical History Tours of the Old Town hotel ($19.56), which was revived and expanded in 2005. She points out intimate spaces, and more expansive ones, including the pool grounds. For fans looking for a deep dive into Scottsdale of the 1950s and 60s, splurge on the hotel’s new indepth Insider Midcentury Tour. The three-hour tour visits the hotel, the nearby Garden Apartment District, built in the same era, and Ms. Bailey’s own architecturally notable home there, as well as the Price House, designed by Frank Lloyd Wright ($700 group rate for up to 10 guests, including transportation and a donation to the Price House Foundation). What you see at Cartwright’s Modern Cuisine — a rustic, cowboy-friendly steakhouse — is hardly modern. The co-owner and chef Brett Vibber, who bought the longstanding restaurant just north of Scottsdale in Cave Creek nearly two years ago, focuses on the menu rather than the décor. And that menu is both radical and beautiful, often featuring foraged ingredients and Native American preparations arranged on wood slabs and wreathed in herbs and baby greens. The chef also spends one month each summer working on a commercial fishing boat in British Columbia. The result are dishes that might include Haida Gwaii salmon with Navajo-steamed corn and Pima wheat berries ($32). Order the tasting menu ($85) for the full tour. One of the advantages of Scottsdale’s weather, even in the relative cool of winter, when temperatures range from about 40 to 70 degrees, is socializing outdoors. Jade Bar at the Sanctuary on Camelback Mountain Resort & Spa, in neighboring Paradise Valley, which is zoned to limit outdoor lighting, offers opportunities to get cozy around an outdoor fire while gazing at the constellations overhead. Warm up further with a cocktail, such as the Hanzo, a spicy bourbon and bitters ($16). Or head indoors to the window-wrapped lounge for a rotating lineup of live jazz, pop and R&B. Skeptics may abound, but there are good bagels in the desert thanks to the 18-month-old New Wave Market, a sunny bakery and cafe in shop-filled Old Town Scottsdale. Boiled and baked in-house daily, the chewy bagels come solo ($2 each) or, better yet, as sandwiches. Try the toasty black-and-white sesame bagel with heirloom tomatoes, avocado and a subtle lick of chili ($7.50), along with a rich cup of local Peixoto coffee ($2.50) for a filling Saturday starter. Wait for your order while browsing the market for local jams, chocolate and gifts. Scottsdale’s motto is “The West’s Most Western Town.” That’s debatable, but in its defense is the Western Spirit: Scottsdale’s Museum of the West in Old Town (admission $15). The 43,000-square-foot museum offers an encyclopedia of Western art, from a rare display of Hopi ceramics to lifelike bronze statues of Native Americans by John Coleman. A permanent exhibition on the upper level makes the case for artists as vital chroniclers of Western exploration and expansion. Then head over to the nearby Scottsdale Museum of Contemporary Art, or SMOCA (admission $10). The intimate museum stages thought-provoking shows — including a retrospective on the last 20 years of video art (through April 28) — and houses a permanent Skyspace, a circular outdoor room with a rooftop opening framing the sky, by James Turrell. Scottsdale has a wealth of public art and a long artistic tradition rather obscured by its proliferation of shopping malls and golf courses. For a look at those roots, venture to the nonprofit Cattle Track Arts Compound, a rustic 28-acre spread of barn-based studios that dates to the 1930s when the surroundings were cattle range rather than residences, and where today about a dozen artists work in wood, clay, paint, print and photography. There’s a public gallery at the entry, but visitors are invited to poke their heads into the work spaces to meet the artists and to shop. Don’t miss the pottery of Mary Van Dusen and the colored-pencil drawings by Mark McDowell. At more than 30,000 acres, the vast McDowell Sonoran Preserve, which keeps much of North Scottsdale wild and undeveloped, offers a variety of hikes on over 200 miles of trail, including the half-mile Bajada Nature Trail. 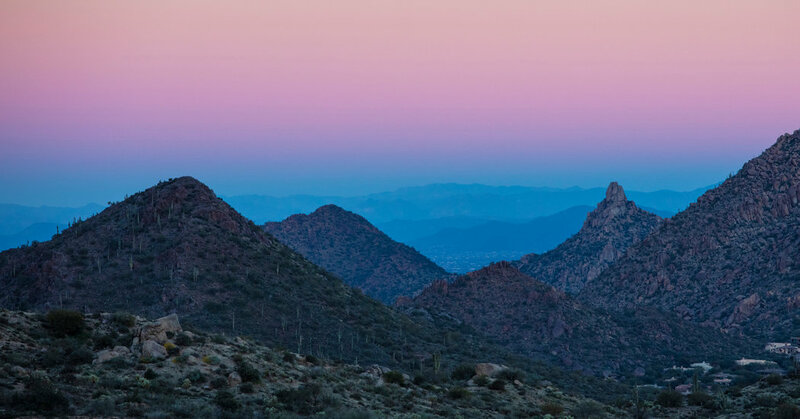 The more challenging 5.1-mile round-trip Tom’s Thumb Trail rises 1,000 feet in elevation, taking hikers past massive granite and metamorphic rock formations, prickly teddy bear cholla cactus and vibrant wildflowers to the namesake outcrop and a panoramic sunset perch. A midafternoon hike should reach the high point in time to see the setting sun, but hikers should leave in daylight to return safely. Few restaurants have done as much as FnB in Old Town to illuminate the agricultural bounty of Arizona. The chef and co-owner, Charleen Badman, has a way with vegetables that is reflected in the veggie-dominant seasonal menu. Recent offerings included butternut squash, jalapeño, persimmons and pancetta ($13), and spicy grilled broccolini ($14), alongside main dishes such as bass with chanterelles in a ginger scallion sauce ($31). Her partner, Pavle Milic, champions Arizona wine, and offers several on tap. The restaurant’s new adjacent FnBar also showcases those local vintages among global selections. Just over the border in Phoenix, the 140-acre Desert Botanical Garden, filled with desert plants from around the world, is a wonder by day. But by night, during the special installation Electric Desert, it’s mind-blowing. Running after dark through May 12, the light and sound show (admission is from $24.95) offers seven immersive exhibits. Among them, one projects bands of colored light across a hillside of saguaro cactus so that they seem mobile; another illuminates barrel cactus in time with music; and a third pulses light across succulent gardens to suggest colorful coral reefs swaying in the current. Like many Midwestern snowbirds, the architect Frank Lloyd Wright initially came to Scottsdale for his health. He settled on its rural east side and built Taliesin West, his winter retreat and architecture school where he adapted his organic Prairie style to the Sonoran Desert, creating horizontal buildings using local rock masonry. Ninety-minute Insights tours ($40) visit his private living areas, the school’s drafting room and the outdoor pavilions and walkways that connect the campus. As part of their curriculum, students still build their own desert dwellings on the school’s 500 acres, which visitors can explore on special Desert Shelter tours ($45, Saturdays only). 11) 11 a.m. Go ahead, indulge! Home to more than 50 resort and day spas, Scottsdale offers experiences ranging from treatments based on the traditional Native American medicine wheel at the Spa at the Boulders to aerial hammock yoga at the Well & Being Spa at the Fairmont Scottsdale Princess. The Phoenician Spa is among the newest and nearly doubled in size to 37,000 square feet when it expanded last March. The three-level building at the Phoenician Resort now includes an aromatherapy blending bar for custom massage oil, generous hot pools, a fire-lit relaxation lounge and 24 treatment rooms. Services aren’t cheap — at $190, the 50-minute sports massage is among the more affordable options — but spa-goers may use the rooftop pool with its panoramic views of Camelback Mountain. The original 1959-vintage Mountain Shadows resort was rebuilt in midcentury style and reopened in 2017 with 183 rooms featuring glass-enclosed showers separating bedroom and bath and a pair of 75-foot swimming pools. A new monthly stargazing program includes a cocktail based on that month’s astrological sign. Winter rates from $179. The new Hotel Adeline takes an affordable approach to style. Some 213 rooms ring a lively pool area that includes a full-service bar. On weekends, ask for the password to get into the hidden speakeasy Straight Up. Rooms from $119. The vacation rental site HomeAway lists over 1,100 properties in downtown Scottsdale, a good base for exploring that ensures some attractions, restaurants and bars are within walking or rental-scooter distance. A two-bedroom condo in the area costs about $165 a night.